This collection of “twelve weird pulp encounters” for the DCC roleplaying game presents small adventure ideas which can be inserted into a larger campaign, taking it in new directions or serving as sideshows to the main course of action. They are neither full mini-adventures nor one-paragraph adventure seeds, but something in-between: typically a small location or situation, given enough detail over two or three pages to start playing, but leaving the larger developments to the GM. While weird/pulp fantasy and minimalism are both popular old school trends, this does not make the writers’ task easy. These concepts are challenging to work with, and the consequences are also easy to see in the collection. The first issue is weird fantasy. Like Monty Python, this subgenre relies on the strange and unexpected, and like Monty Python, it turns stale when it is re-quoted too much and all the surprise is gone. A bog-standard adventure with squid guys is not any more creative than a bog-standard adventure with orcs. Sure enough, the encounters in this book stumble when they go for straight Mythos recycling; they are much better when the authors come up with their own original ideas – and since some of these ideas are actually very good, relying on second-hand Lovecraft comes across as even more disappointing when it happens. Similarly, minimalist design has its own issues. As a reaction to impenetrable walls of text and read-aloud sections which kill interactivity and plain doesn’t work, it is a breath of fresh air; but when it becomes dogmatic, it just results in adventures which are malnourished instead of lean. You lose fat first, but after a while, you also lose flavour and complexity. Adventures don’t have an ideal length: some work better when they are longer, and half of the encounters here would have been much better with more development. None of the writing in this volume is terse and efficient enough to carry a complex adventure situation in two pages: for these specific authors, the module could have easily used 60 instead of 46 pages even after leaving out a few of the less interesting scenarios. So Squid Sorceror is a mixed bag. Some of the encounters amount to “you travel across a swamp and swamp monsters attack” (Shadows of Malagok), “a big bug attacks your ship” (Sails Aflame!) or “you happen upon a three-way battle between two wizards and an escaped monster” (The Nazhghad’s Invocation). Even if some of the background detail is interesting (for no good reason since the players will probably learn very little about it) or the monsters are neat, including these mini-scenarios was a mistake since they don’t really offer anything beyond a slightly spiced up random encounter. A second group of mini-scenarios are based on interesting ideas, but suffer from too much exposition and too little actual adventure. The titular In the Prison of the Squid Sorcerer (called a sorceror on the cover) revolves around a cursed sea cave and its magically bound captive, as well as a group of opportunistic freebooters. As a dark pirate-themed module with Shakespearean overtones, it almost makes it, although dragging in poor Cthulhu flat out kills the mystery (reworking it on the basis of legends about cursed sailors would have been preferable), and with two pages spent on introduction, the rest is mostly a tricky battle in a one-room dungeon and little more. Slaves of the Visitants is a woodland adventure with a great and horrific start, but obvious and slightly disappointing conclusion: too much build-up, not enough actual adventure – just a battle. Cave of the Ice Mistress introduces an otherworldly sorceress – a successful monster on her own with a great origin story and creepy appearance/powers – but ends as soon as it begins with the characters killing her off along with all loose plot threads (which they have likely not even learned about yet). A lost opportunity. Finally, The Cult of the Flickering Sign is an interesting organisation based on worshipping an extra-dimensional nonhuman entity – perfect for a seedy city, except the cult’s mystery lasts only as long as the characters make one step from the initial encounter, where they immediately find and kill the cultists, as well as the entity’s emissary. See the pattern? It is too bad, because both the entity and the cult are perfect for a game of city intrigue, and could easily have become a memorable group of returning villains. These scenarios all fall short of delivering on their promises: if they are used the way they are presented in this book, they will fail to realise their real potential, and become one encounter among many. Reworking them is strongly recommended. Finally, we have five encounters which work without reservations, and represent the really good part of this product. At their core, Swindled at the Laughing Harpy and Another Man’s Treasure are item-based scenarios, both featuring situations, magic and characters which would feel at home in Fritz Leiber’s Lankhmar stories (the first has a vivid villain; the second a simple writeup of a loanshark’s lair which is tremendously evocative). These are very short at two pages each but they offer a scope beyond their actual length – which is in contrast with the volume’s less successful encounters. 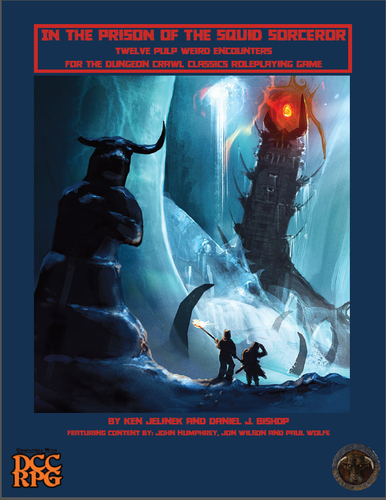 The Long Sleep is a conventional mini-dungeon (abandoned mortuary with undertaker’s quarters and a small crypt), it is just very well written, oozing with unsettling imagery and monsters which will remain fresh in the players’ memories for a long time to come. The last two encounters (really mini-adventures) are departures from conventional module design in the sense that they consist of encounters intended to be introduced over the course of a campaign, parallel with other plotlines: this way, they only form an adventure as the players gradually experience the strangeness in the background of the usual events. This idea is fascinating, imaginative and effective. In Mermaids from Yuggoth, a slow clash of timelines brings increasingly strange events to the PCs’ home base and heralds an invasion by… well, you have probably guessed it. They are the same fun gals we already know, and they have come for our brains. The actual invasion – suggested to be a horrible, overwhelming strike – only consists of six 5 HD monsters, which is probably an “appropriate challenge”, but slightly underwhelming. The other mini-adventure, Icon of the Blood Goddess, is the best part of the collection. Gradually introducing a menacing goddess and her cult into a sprawling city, it is a powerful combination of vivid imagery, gradually escalating challenges, and a basically free-flowing pot. Here the collection is at its most leiberesque, without resorting to simple imitation: it captures the spirit, not the letter of the Lankhmar stories. Although I am slightly sceptical any player group would let the events run their full course after seeing that something is afoot, there are unsettling events, weird encounters, and an epic conclusion in another dimension. Anyone running a campaign that features a sinful metropolis could get a good use out of the material here – it’s the stuff of swashbuckling weird adventure. This mini-adventure is the collection’s best, and at eight pages, also its longest. Coincidence? I don’t think so. To conclude, like most adventure collections, this is a work of uneven quality, and in my eyes, it works best where the authors stray from the formula by letting themselves create a more complex adventure framework, and where they rely on their own talents instead of working from the Lovecraft playbook. Roughly half of the adventures are more interesting for mining ideas than for their full content, but the other half are solid and game-relevant. While the price of the PDF is higher than usual (which is unsurprising when we consider the high production values), it is these, and especially the final adventure which make this collection worth purchasing.